We Have Changed the Domain World for the Better. SiteDomains. Today we have some very exciting news that I want to tell you about. It's fitting to kick off 2016 with a bang, so I can't wait to tell you about what brand new platform is now available to ALL members of Wealthy Affiliate!! For the past 10 years we have been building WA with the goal of allowing the most people possible (everyone) to be able to build an online business. One of the challenges has always been technology and getting people over the fears and difficulties of building the foundation of their business (their websites). Today we are announcing a system design to fill the last MISSING link and makes WA a totally complete website building platform...removing one of the biggest technological hurdles people face! You can now register new domains right here within Wealthy Affiliate! This means that when you are ready to secure your next domain name, you can do it right here within your WA Account! The SiteDomains platform will instantly allow you to uncover any domain in seconds. This feature will expedite your domain research and truly uncover some of the true domain gems out there. All Your Domain Needs in One Place! Each and every domain includes EVERYTHING you need and we do not upsell you like every other domain service out there. What you get with your WA domains is everything that you need to build your sites - privacy included! Oh, and we don't charge you more for renewals. You can expect the same price for as long as you own your domain! Your privacy was at the top of our list when building the SiteDomains platform. We are constantly hearing about folks in WA getting unsolicited scam phone calls, emails, or even registered mail sent to them because they have not protected their WHOIS (contact) details of their domain. At WA, we include PRIVATE WHOIS protection with every single domain, this isn't an upsell, it's built right into the highly competitive pricing. We also include additional levels of security with your domains to help prevent you from ever losing your domain to a competitor. We wanted to build the domain experience that we have always wanted, and SiteDomains is it! Simple, Secure, Private, and filled with features! Your Domain will already be setup on our servers ready for your website to be installed just a few minutes after you purchase, so you can literally get your site published and live on the NET right away. No more fumbling around with changing DNS to point at our servers either, this is all setup for you - it's completely hassle free! What about domains that you own from other Domain registrars? Domains that you own at other registrars will continue to work the same way they always have. In-fact, you can still purchase domains elsewhere and point them to WA Servers...though there is no reason to ever need to now. SiteDomains can be your choice moving forward for all domain registrations. It's completely integrated into your WA account, removes all technological hurdles, includes security, and is very competitively priced. When registering domains through WA, you are instantly setup and ready to use all of the SiteRubix features like SiteFeedback, SiteComments, SiteHealth, SiteSupport, and others we are working on! You'll be ready to rock right from the get go. You will even earn $1 from every domain registration from people you refer to WA! These will also be recurring commissions so if you sell a domain now and someone keeps it next year, you will get a $1 recurring commission next year. Many people also bulk buy domains, so if someone buys domains in multiples, you will et $1in affiliate commissions for each. Don't be surprised when you start seeing TWO $0.50 credits (total $1) start coming into your Affiliate Account. SiteDomains is available to EVERYONE! Whether you are a Starter or Premium member, you will ALWAYS have access to WA domains! We have made this part of WA always accessible to you regardless what the status of your membership is. ==> Check out SiteDomains Here! I have other domains registered else where and had to pay for the privacy, so I think this is one huge advantage of SiteDomains. I just recently registered my first domain here and will be taking advantage of the 25 slowly in the future. The price is affordable to own your own domain, "why wouldn't you", Thanks Carson for re-publishing this article (post), I am just in the middle of writing my review and the information here is not something I thought to include. It is only now that I have read this. Good to know we have commissions whenever our referrals register a new domain name via this platform! Can all domain extensions be purchased or transferred to WA. For example can I transfer a .co.uk or purchase further .co.uk domains through WA? When I tried it returned an error saying “tld” not supported, was that just an error on my end or is there a reason WA do not support .co.uk domain purchase? and 2) do I automatically get the privacy protection or would I need to purchase it in this case since I'm not buying a new domain? You don't need to transfer it. I ususally wait until it is within a month of renewal before I transfer to WA as you will need to purchase another year of registration when you do. If I am rebuilding my site anew, (following deletion), wouldn't transferring it here make it easier though, as I wouldn't have to go through transferring the hosting back here, as I suspect I will do if I delete my site first. hosting is a simple change, registration change is a bit more involved. If you are starting over, just purchase your new domain from WA. I would, but I'm using the same domain. I'm getting there now thanks. Sou novo tenho muita curiosidade de aprender e ganhar dinheiro na internet. Just want to say what a fantastic service this is!! Thanks to both of you, well done once again! Happy to read this post. Thank you my dear Carson. I'm now confident to buy my first domain. Before that I was a bit confused about where to buy a domain. However I still have one issue, how to transfer my existing siteRubix website to the new domain and what effect it will have on google ranking. Well, stepping aside of the "dear" issue.... I'll answer the question about transferring a SiteRubix site. Once you have a domain hosted here, which is automatic if you purchased a domain here, you will have two sites. All you need to do to transfer content is to click the "move" button on your dashboard. The sooner you transfer your content, the sooner your new site will rank. Also, you may want to delete the Site Rubix site entirely, or, at least, break the connection and change the duplicate content asap. Many thanks Toni, you are so kind. I am not sure whether there is an additional button now to give you the choice during the transfer. Just make sure that if you keep the Site Rubix site, that it's completely separate after the transfer because, one time, I had new posts - posting to the old Site Rubix site. Or, as mentioned earlier.. somewhere, you may just delete it entirely and avoid any problems altogether. Thank you dear, you have been very patient with me. I wish good health to you always. Thank you! Good Health is so very important, so I appreciate that! ...And, I wish you good health as well! The domain pricing here at WA is very good. Go daddy has the most incredible add ons to buying a domain name.When I was with them, their pricing was always considerably more the next year. Am I able to pay for my domain name with Payza? I don't think so but ask Kyle directly. Has anyone been successful with WA??? I really want to try this but I'm a little nervous. I am not good at computers & having to setup a domain & site? Ahhh, should I get my 25 year old to help me with this? Several members are highly successful, many of us are making money, more are starting to. You can click on "activity dashboard" (to the top left) and select "success !" Don"t worry about getting lost or stuck... take small steps, follow the training and you'll be fine. OK I thought that once I bought a domain name from Name cheap or here , that was it for out of pocket expense. No fees to transfer or add my domain name, but its ok. There is no additional cost to add your domain to SiteRubix for hosting, all you have to do is point the domain to their servers. If I remembered I could add them here, but it hs been awhile and I am not sure anymore, better to check and get the correct links...Best of luck! There are no fees to transfer name servers and leaving your site with its current "Registrar" (Namecheap). There may be fees associated if you are transferring "Registrars" depending on your current Registrar and the time left on the domain's Registration. If you are hosting here at WA, and keeping your NameCheap as your domain's Registrar, you only need to change your name servers. Change: NS1.MYWAHOSTING.COM and NS2.MYWAHOSTING.COM. Then, allow 15 min and up to 48 hours for it to propagate over to your new hosting site - WA. Once that's done, then, you create your hosting account by adding a new website "on a domain you already own." Add your Title of your website, choose a theme, and click "create my site." Then, log in through WA. That's it! That's what I did. I've been contacting support here and at Name cheap, but still I have been struggling to add my domain name here . I tried again yesterday , it said Oops an error on our part, WA so I contacted support here again and they said I have to purchase . I'm a little concerned. I know this will get resolved. Did you purchase your domain with Namecheap? And, if so, did you change the name servers yet on your Namecheap dashboard? If you did change the name servers, have you checked with them to see if they have changed yet? It takes "up to 48 hours" to redirect. Support here at WA won't be able to help you unless you did (all of) that first. Hi, I did purchase a domain name from Namecheap and changed the name servers . I have been in contact with namecheap regarding this as well. I've explained to support here as well about namecheap, buying a domain name from them. Then there was an issue with the name servers being pointed but fixed it and unlocked so the name servers could be pointed here but now support is saying the reason I can't add my purchased domain name here is because o have to purchase a domain name here when that's not true when I already bought from namecheap. I'm getting concerned but I know this will get resolved. I sent another message to namecheap letting them know too. Thank you for getting back to me. It may not be relevant to your issue, but I know it's a pretty strict policy that you must wait 60 days after the initial registration or any previous transfers to initiate a transfer. So if you purchased a domain at Namecheap, you would have to wait 60 days before being able to transfer the domain to Wealthy Affiliate. And that's not a WA policy, that's a ICANN strict standard that all hosting companies follow. Can you link multiple 'Siterubix' sites to 1 domain set-up through WA? You can but it is poor SEO practice to do that. Thanks Labman. Just getting started here. This is very cool. So here is my question. I have some domains with GoDaddy and I use Weebly for the platform. Since they are pretty established sites I don't know if I want to move them to WA. Can I transfer the domains to WA but continue to use Weebly for those particular sites? Have you gotten answers from anyone? Yes, you can transfer domains to WA while continuing your site(s) on Weebly. Hi - Just to clarify... WA hosts your sites via membership. In addition, WA now offers domains. So, when you ask whether you can "transfer" domains to WA, but still wish to use Weebly, a hosting platform, then you are only talking about changing "Registrars" for your domains - correct? If so, it will take some time to change Registrars, have the site propagate over then change those name servers, assuming you can, to point to Weebly which, by the way, is only free up to 500Mb. Is that what you wish to do? Probably not. I've come to the conclusion that over time I am going to rebuild those sites here at WA. I've transferred one that was fairly new and considering two others that haven't been well established or even published yet. The one I am most concerned about is my www.nelsonsewing.com site because it is the most well established site I have. I don't particularly want to lose any ranking I may have established but that may also not be a big issue either. What is your opinion on the matter? Now that I am learning more about WordPress and what it has to offer and how to use it correctly I am changing my tune a bit about Weebly. Okay that was the answer I was looking for. Now how do I go about making that happen? Sorry - was busy with "mom issues," but all is well now. Re: "losing ranking" - for what? If you, or anyone, changes host providers for any site, whether new, or old and indexed, it really doesn't matter. Your site will be temporarily "down" until it propagates to the new host. People do this all the time... Re: the content, however, I am not sure how you will back-up your content on Weebly, nor do I know if it can even be transferred to WordPress in its current state. I rather doubt it.. but then, I'm no Weebly expert. In the past, when I have transferred my nameservers to another host provider, I actually copied the html code into a NotePad file for every page that I wanted to keep - content and images. Once the site propagated over, I cut and pasted the code into the new "vehicle," in this case, WordPress and tweaked from there to re-publish the site quickly and get it up and running again as soon as possible. You do not want your content missing for very long - as that time delay WILL affect your "ranking." Okay good to know. Thank you very much. Sounds great! So..., from what I understand is that if I already own a domain name from somewhere else and just host it on WA there’s no Privacy Protection, and Email Accounts included? Ecerything is included. I moved mine and I am delighted. That depends on the company offers where you purchased your domain. Hi Carson, I like the comparison chart between siterubix, godaddy, namecheap and name. Can I use it in my website please? Thanks. Yeah, hopefully more TLDs will be added. I was looking for .it as well, but that is not included either. This is a nice added feature within WA. It is true that purchasing somewhere else opens you up to tons of solicitations, it happened to me . They want to sell domains cheaper by a few dollars then charge you 8 more for protection. Can I renew my domain name I own on namecheap to WA next year or am I stuck with them now? Or can I move all my content from the site I have to a different domain name at WA if I am already indexed? Great job guys, this is a huge addition to Wealthy Affiliate. Well needed and well done! Just wanted to say how amazing this is. So much easier. I tried to transfer my domain, but was told by Kyle that the system is not set up to transfer domains yet. He did say they were looking to do it in the future. I think you're talking about transferring "registrars?" Right? If so, and if Kyle has already told you that WA isn't ready to transfer domains yet, then you will have to renew with your current registrar but point your DNS to WA's servers. Once your domain is renewed, is pointed here, and you have opened up a hosting account for that domain here at WA, THEN, you can transfer the content from one site, such as a Site Rubix site, to your domain site. I believe the clarification needed to be stated... .. Transferring domains is hugely expensive and very time consuming. I think you are getting muddled up with transferring hosting, which is what all the rest of us do. Takes seconds. Costs nothing. All you need to do is set your domain nameserver to point to WA. Every domain registrar has its own way to do that, just ask them. I've never experienced a huge expense when transferring Registrars. What makes you say that? It is easily done, but it does take a bit of patience depending on the Registrar as you have to release it from one Registrar and get the other to accept, etc. But, in this case, no, I don't believe he needs to transfer. He just needs to point the servers as you have pointed out. Sorry, I should have been clearer on the expense issue. What I meant was that the cost, to WA, of setting up the capability to handle transfers between registrars, is a non essential. I see... well, that's not for me to say.. It's their biz... But, I see your point. I have domains I purchased elsewhere that are up for renewal. Can I transfer all that and renew them here instead of there? Just to clarify the answer given by @ShannonSB - No you cannot. What Shannon means is that you can transfer your HOSTING just by editing the DNS entry. But you cannot transfer your DOMAIN (which is the question you asked). Read the answers by @MsMoneyHoney and @rodc above for additional clarification. I apologize if my previous reply was confusing. For now, those who already have domain names with another Registrar can "point" their domain using the DNS changes. Yes. For those who want to actually change Registrars, yes, I imagine that we will, at some point, be able to transfer our Domain Registrar to WA when either Kyle or Carson let us know. It is my understanding that WA cannot receive a transferred domain as yet. So, for now, if you have purchased your domain elsewhere, you can only point it to WA. If you haven't yet purchased your domain elsewhere, hey! Purchase it from WA direct! Capisce? I own several sites and I'm still learning the real website building instead of the old drop and drag. Looking forward to building our Churches web site here. Also, is there a way to get an affiliate link to the Site Domains Page? Go to the airplane icon and copy the section that is after the .com (starts with ?a_aid=) and paste that onto the end of the site URL. This will work for any page inside WA. Oh ok. Thats good to know. Thanks for the help. So the $13.99/year, that wouldn't include hosting right? or would it? Hosting is free at WA. Yes hosting is free as long as you are a premium member. Hi Carson. This is great news. Guess this makes it a one stop shop. 100% newbie question again: If I have a domain.siterubix.com site, and I register a domain.com with WA's new SiteDomains, is the transfer process the same as per other domain registrars, like namecheap etc? You don't have to transfer. It is automatic, it takes only a few minutes for it to come online. That's interesting. So you're saying that the domain.com I register on WA's SiteDomains will automatically know to point my existing domain.siterubix.com to it? I don't need to do what is taught here by Kyle How to Transfer a SiteRubix Website to Your Own Domain ? You will still have to click the "move" button and select which website should redirect to which website (I imagine), but you won't have to update the DNS like previously done when your registrar was outside WA. Yes, Nathaniel is correct. You won't have to transfer the DNS, but you will have to transfer your content. That is not automatic. Thanks for the note, Toni. Yes, that makes sense. Will try it out! Hi Carson, thats great and very welcoming news indeed . I have stopped most of my activities in order to give WA priority. The domain news comes at a very good time for me...infact the timing could'nt be better. Wishing you and your family a highly prosperous and happy 2016. Take care, Johan. Sorry I've been away for a couple of months, pressures of work. However, now I'm back and I've got a ton of plans for 2016, one of which is to start teaching ESOL online, using Skype or something similar, and also to publish ebooks for sale (not on the same site, obviously!). Can I do all this through a site and domain from WA? Hi - Your blog can be pretty much anything you want it to be, and more!. Yes, you can teach English using your blog as a marketing tool and/or to set up Skype or Webinars, etc. AND, you can sell ebooks too. There's a plug-in for that, and there is the ability to link Kindle ebooks on your site as well. I see no limitations for you. Looks good - is Site Domains ICANN accredited? I believe this would offer a lot of validity when we're offering this to people outside of WA. Also, why are some domains priced at $13.99, while others are priced at $15.99? Carson, this is an awesome new feature. I love the built in site privacy. Buying domains will be more convenient! Is anyone else having issues with the registration of their domains? I tried twice (both PayPal and CC) and I am refunded a couple of minutes later. We will definitely look into this for you Vanessa. Many people are successfully registering domains at WA, so maybe give it another try now? We will be looking into this I'm detail to see why the registration didn't go through. When the registration fails, we instantly refund. Thanks for your patience while we investigate. I just redid it for the third time and I got refunded again! Carson would you be able to check with your IT team the error code that comes up on your end? When I contacted tech support they told me they forwarded my message to you so you'll get back to me through private message. Thank you for looking into this! We will get to the bottom of it Vanessa, chat soon. Try once more Vanessa, we found an issue specific to your attempts to register a domain. It should work now for you. Can I get affiliate commissions for people who want to buy a domain name using SiteDomains but don't want to join Wealthy Affiliate? I would love to know this as well. If the answer is yes, banners would be great! That's a great question - like Jason - I'm curious too. Anyone that you refer to WA who buys a domain, will earn you two credits that you can cash out for $1. They do not need to go Premium to purchase a domain. That's fantastic Carson. Thanks for letting us know. "You will even earn $1 from every domain registration from people you refer to WA! These will also be recurring commissions so if you sell a domain now and someone keeps it next year, you will get a $1 recurring commission next year. Many people also bulk buy domains, so if someone buys domains in multiples, you will get $1in affiliate commissions for each." - Edit: Oops, didn't see Caron's personal reply to you! Love the latest addition to the WA journey. Makes it a lot easier when everything is in one place. Will WA host your website as well? That would be truly awesome! Yes, hosting is included in the Premium package. Can we get an SSL certificate on WA domain websites? Truly I didn't see that option in WA but have seen from other hosts like HostGator etc. This is only my information. If you have better information please send me also. thanks. I will let you know if I do. Josh, we do not have SSL certificate capability here. Just found out. This is so awesome, Carson & Kyle!! You are great and things keep getting better. I am eager to know when the ability to transfer domain names over to WA is ready. Hi Carson, I have a domain that it is time to renew, is there a way to move that domain name here using this new platform? Having purchased a domain from WA SiteDomain, I went to set up my Website using SiteRubix, but since I am just a Starter member there was not a way to create my free site on my own domain. I can't become a Premium member until my business can pay for the subscription, but I really want to get set up properly, on my own domain. Please help! If you purchased your domain, it's yours no matter where you purchased it from. You own it, you control it. But, only premium members may set up their hosted site on their domain they own. Therefore, you will have to use the SiteRubix free subdomains until such time you become premium. Then, you will just transfer the content over to your own domain hosted here. Exactly, you can only host domains you own here at WA as a Premium member (as that is part of our Premium service), but you do own the domain and you can host it anywhere you like. Start with a SiteRubix website for now and when you do upgrade to Premium down the road you will be able to transfer it to this domain. Hi Kyle I am due to renew my domain from a third party in March. Will we have the possibilty to renew with WA by that time. Hi guys, I just tried it and all worked fine till I got to the payment, but there it stopped. I really WANT this domain-name, please let me pay! What about you - want to follow? What happens when you attempt payment? Are you still having issues? I am going through step 1-3 of the process without any issues. The check for the Domain name was very fast by the way! When I push 'Continue' to 'Select payment method' I get no response today as I did yesterday. Two fields in my contact details are yellow; the city and the zip code. The State/Province and City are the same -- Abu Dhabi in United Arab Emirates (UAE). I have changed State/Provinve to AD/UAE, but the City field is still yellow, so it looks like it don't like Abu Dhabi. I changed the city to Dubai and the field turned white. In UAE they don't use a zip code so I yesterday wrote "Not used" in the field. Today I tried to use my P.O. Box no in the zip field and it turned white, so apparently it needs a number. But still I can't access the selection of payment method. So now I'm out of options and need some help. How about you - will you follow? PS. My problem aside, this is a fantastic addition to Wealthy Affiliates as it makes WA the ultimate resource for any online marketer! I tried it again yesterday and it went through and I got my domain name! I installed it and made a blog as well yesterday and planned to make more keyword research today to get some long tail expressions to start making content.. But to my suprise I discovered that my domain name has been rejected and my money has been refunded. I will concentrate on jeywordresearch now to find the 'low hanging fruit' to make a new domain. We will take a look right away Sarah, hold tight. Give the domain search another try Sarah, I briefly saw a delay in the search but it seems to be working now. We are investigating to see what might have caused a domain search not to return a result. Carson can these domains be directed to other Hosting as I run Programs that require changes behind the scenes and I need a CPanel to do that, like running email and big Azon Stores. Hi Sarah, we do not support AZon stores or cpanel for security reasons. Great job Carson!!!. I hope Carson, you will in future create Banner widget or something for us to place on our site like Jaaxy? Incredible update. :) The last missing piece. We can still tell people that they get hosting and siterubix.com domain name for two sites in the free membership, right? Fantastic addition, Carson. Thanks to you and Kyle for continuing to make WA better and better! Hi Carson, I'm a premium member I purchased a domain name through WA after this was posted, set up a website but when I go to site manager it shows my domain site rubix com Shouldn't it be my domain name com or my domain wealthy affiliate com? I've asked this question within the community and I guess since this is so new no one can seem to help me. Any help would be appreciated. Melanie, I think you should put in a support ticket for this issue. Click on "Site Domains" to see if it's listed. If it isn't, are you sure your purchase went through? Thank you ALL very much for all your help. I was actually able to set up another one and it shows correctly now but I have 2 so I guess I just delete the one that says site rubix. Awesome! WA just keeps getting better! Good idea! means I can transfer my domain name in WA too? Yes, you can transfer your current domain name to WA. "...Many people also bulk buy domains, so if someone buys domains in multiples, you will et $1in affiliate commissions for each. Brilliant.....as the Britt say !!!!!!!!!!! Sounds like a great feature. Should be a step up from other domains. The convenience of it being on WA is worth using it. I will definitely use it. Thanks guys. Thanks guys slwsys one ahead of all the rest. Keep up the good work. Just one question can we transfer our old domains over here? What is the renewal price and why is it not included in the total price for WA, but it is for the other registrars? Renewal price is the same as the original price. Just to clarify how this works. If I buy 2 domains the person above me only gets a total of $1 commission not $2? What happens if I buy 3? As I understand it is $1 for each one. Don't mean to pester you...but, regarding Domain Forwarding. Is that possible with SiteDomains? Also, I have a domain expiring this month. Will we be able to transfer our domains here by the 25th of January? That link you sent me to talks about pointing your domain name to WA servers. I wanted to Forward anyone who enters in my domain name in their browser to a URL of my choosing, like an affiliate link. Or, was there something in that tutorial that I missed? Yes, it most definitely is. Within the SiteDomains tab, you will be able to manage all of your domains that you have here, including ones that you have purchased through SiteDomains. A feature of SiteDomains domains is that you can redirect your domains (forward them). You can see this below in the attached screen capture. Ahhh, thanks Kyle. I didn't see it under the settings since none of my domains were purchased from WA. Any idea when we can transfer GoDaddy Domains here to WA? This is already in development, to do it "right" though we want to spend time refining the process in a way that is the most seamless and makes the most sense. I imagine that this will definitely be a early 2016 update, in the next month or so here. 1. If a FREE member buys a domain name here, can they use the WordPress builder to build their site, or, is that just for paid members? 2. If I were to buy a domain here and build a website here for a client and they decide they didn't need me anymore, can I transfer/migrate their domain and website to a Host/Registrar of their choosing, i.e. GoDaddy? 3. Is there an appropriate place in WA where we can post a website for sale? Or services? ... like we had in the old WA? Any news on this? I've had someone ask me about transferring their domain names to WA, but don't know how it would work. For instance, they need to wait until the domain name expires right?, and do you risk the chance of losing it once it does; given the lapse in time that it takes to purchase your domain here at WA? Just to answer a couple of your questions. Wordpress is free for everyone with or without a membership at WA. I actually did a review on this on my website. I've seen other training platforms actually using it as well. As for your second question; this is true. You can transfer domains to a host of your choice. It would be the same if someone wanted to transfer another domain hosted elsewhere to WA's hosting. Thanks for your help, and I hope my responses were helpful to you as well. Thanks for the link. I checked out your review and in the image it said building a site on YOUR OWN DOMAIN is for PREMIUM members, so, that just answered my first question. As for the second question, I would think what you said is true. I just wanted to confirm with Kyle / Carson that this is indeed possible. And, better yet, if they had a tutorial on how to transfer a site and domain OUT of WA (which goes against their interest, so, I doubt they would have a tutorial on how to do that). I know what you mean. That would be interesting. I would think that it is similar to moving a website to a domain, which SiteManager allowed me to do with the click of a button. Really easy. I haven't found a reason to move hosting so I don't know. I do have issues with my site speed, but that's something that I'll probably be learning within the upcoming training, and I think it is a more of a plugin situation. I am a newbie to all of this. I have chosen my niche. Considering WA now offers WA members the ability to register their domain right here I have done that as well. 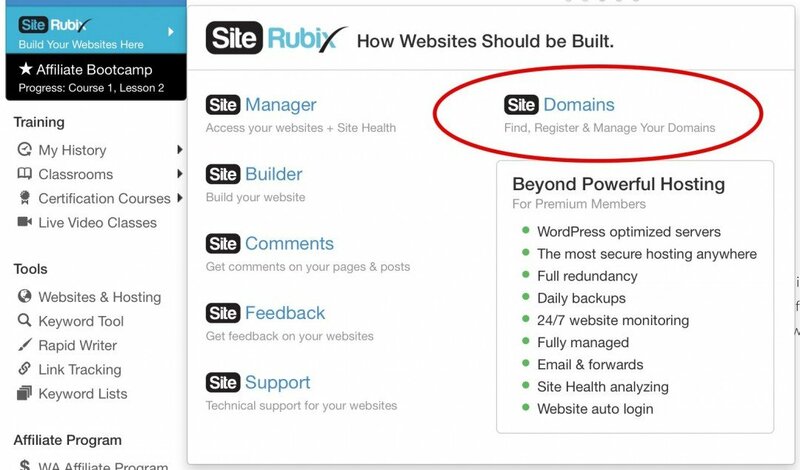 I am a confused as to whether to choose to start building my site in the SiteRubix selection to build "A Free Website" or "On A Domain I Own." Any direction anyone can offer is appreciated. I did the paid domain because I have heard that affiliates don't like to see the "SiteRibrix" attached to your URL. I don't know if that's true or not, but for the $13 I felt it was best to cover myself and just have my own domain. Other members may have a different opinion on this - good luck and let your gut/trainings lead you. Thank you, shanbrack, for your quick reply. Wow, amazing as usual, we have been getting a lot of question in chat about this for people trying to register their new domain they paid for through WA. Everyone was stumped until now. We will have the link to pass around. Thanks for all you do Carson. Yeah, the process (formerly prior to this) was confusing. With SiteDomains we have removed the technical aspect of buying domains and connecting them with your website, this is all done for you automagically! Hi Carson, because of these awesome new feature now I have to rewrite my review or put a link in the review so people can read of the changes and these specific feature. Here I go multi tasking again. just registered a new domain, www.bewealthybefree.com at WA. quick and seamless. Thanks for everything. Awesome, congrats Jean. I like it! That's good news Carson thank you. I like this Carson. When I am ready for my next domain, I will be getting it right here. Why should I go elsewhere? There's almost no reason to go anywhere else! This place just keeps getting better! Keep up the great work! I have a web and it's domain and hosting is expiring at the end of this month. How can I move it to WA? I have a password for it and would like to move it immediately as it may just disappear at the end of the month. I imagine that it will be available within the next month once we refine and test an appropriate process for doing this. I need information on changing the web with the use of only a password. Great! As soon as I can transfer domains, I'll be renewing them here. Awesome Shelley, this is already in the works! If you eventually incorporated domain transfer as well would the change over be smooth enough with minimum downtime of my site? Hi Alan, transferring your domain from another registrar where the DNS is already pointing to WA, shouldn't cause any downtime. I don't want to get ahead of myself though, we will update you and everyone as we move forward with this. Excellent and thanks for answering so quickly. Awesome Chuck! Glad you enjoyed the flow and felt the process was smooth. Hey Shannon, if you are a little overwhelmed by the info about SiteDomains, don't worry. You will learn all about websites and domains and the lingo in this post as you move forward in the training. Wow! SiteDomain is great news, Carson. I have one question. I have a domain from name cheap that is coming up for renewal soon. Do I have to continue with name cheap or can I Purchase that same domain from SiteDomains? Hi Eric, at the moment SiteDomains is only for new domain registrations, but there has been a lot of interest in folks wanting to transfer their domains from other registrars over...Kyle and I are working on making this a reality! That is awesome Carson. Thanks for clarifying that. Thanks, Carson. I'm really elated and is looking forward to that day. Hi John, you can register new domains at WA now. To renew a domain that you already own would require you to transfer your domain over to us. This feature isn't available yet but we are working on that! Good to see WA starting to become a "one-stop-shop" for the affiliates to get everything they need to build their online businesses. Congrats! This is a great addition to the excellent services that WA provides. Thanks. With value like that it's hard to think of why I wouldn't start buying all of my domains through WA. It's easier, more cost effective and you get the privacy. Win win! Definitely keen to learn more about bringing existing domains over also if possible. A couple of questions. How does one go about migrating a domain purchased elsewhere to WA? Can customer accounts registered at WA still have different hosting? We will be working on transferring domains from other registrars to WA, it's been a popular request! Domains registered at WA can use hosting anywhere in the world by simply updating the DNS. For example, some folks have their own dedicated servers on other web hosts. You can register your domain at WA, the point to your dedicated server by updating your DNS. We do not force you to use WA hosting, although it is packed with features and security you cannot get anywhere else in the world! @Craig, thanks for bringing up this "flexibility" question which made me think of another question. @Carson, If we were to buy a domain here and build a website here for a client and they decide they didn't need me anymore, can I transfer/migrate their domain and website to a Host/Registrar of their choosing, i.e. GoDaddy? Also, (Carson), when time permits, could you check out my question in the comments above? >> "SquidooSlfMstr"
-What happens if someone registers a domain through WA and later stops their membership? Are they able to continue to use WA as a domain registrar and just point the name servers to a different hosting provider? If that's not the case, is there some functionality to transfer the domain to another registrar? -Is there a way to use WA's email service without changing the nameservers to WA's name servers? For example, if someone wanted to host their websites some where else would it be possible just to set the mx records to WA and use WA for domain email? If you do decide to let people transfer domains in, I'm going to have to definitely consider. I would much rather give my money to WA for domain renewals than godaddy or namecheap. Hey Thomas - great questions! 1 - If someone were to cancel their Premium membership, they can still access their SiteDomains page within WA. They would be able to change their nameservers and point at any other web host of their choice. You can change your nameservers at anytime from the settings menu of each domain you register here at WA. 2 - Email requires you to be a premium member and have your domain hosted at WA. As a starter or cancelled premium member, email, hosting, support, is not included with domains. You could point your DNS at any web host and use their email service. 3 - it's clear that transferring sites in to the WA platform is a popular request. We will be working on this. Thomas... I am the opposite. I'd like to be able to host my domains at WA, but set the MX records to another provider like Office 365. Question: If someone leaves WA after buying a domain what happens to their domain (access/ownership)? I'm asking because newly bought domains need to be at least 2 or 3 months old (forgot which) before you can transfer them to another registrar. Hi Jay - you can still access your domains page her at WA if you cancel premium. You cam simply change your DNS to another web host of your choice. Domains at WA are always accessible regardless of your membership status. OK thanks. Just wanted to know because I have a feeling this is going to be a frequently asked question. OMG!! The domains plus the privacy!!!! I could have saved SO.Much.Money! I'm so excited. I want to verfy Carson, because I know my referrals will ask. If someone registers a domain name here and builds their site, and after a year decides to leave. Can they transfer out their content AND their domain name? Also, will this be available to non-subscribers? Yes, WA domains is available to starter members, premium members, and cancelled premium members. You have full control to change your DNS and point your domain to any web host you want. As a Premium member of WA you get to use our premium hosting and SoteRubix platform of course, but you have control to use any web host you want. This is really great! Will that comparison chart you have above be available as a banner to use as an ad in our affiliate websites? It shows what a better deal this is. So we will still use siterubix to develop our sites in and then when the site is ready then buy a SiteDomain and move it then? Hi Barbara, the comparison chart will be available on our website, and we will likely put it in the banners area in the coming few days. And yes you can build a free SiteRubix website and move it to a domain registered through SiteDomains when you are ready!! It's seamless!! Thanks, Carson! That is great to hear. I will gather all my spread out domains and put everything here! Hi Carson, I read about this and it is great news. This will make things even better. Thanks! Wonderful news! Thanks for always thinking of us! Ok I wish I had known this was the plan I would have waited to buy the domain. Doesn't matterI will buy all future domains from WA. Just a wonderful release into the New Year. Thank you Carson, this is really some great news. I only wish this had already exist when I started here at WA. Looking forward registering a new domain in the near future. Wow! guys this certainly is starting the New Year off with a bang, the other registrars will certainly sit up and take notice. Congratulations and a job well done guys,you never cease to amaze me. Just when I thought Wealthy Affiliate could not get any better....well done guys! Thank you Carson. I hope your family life will be a better one this year.....Tom. Very good news, indeed! Since I am starting building my first website, can i switch right now from siterubix.com to my own domain after I buy one from WA. Let me explain a little more: The website i am building with Kyle's instructions through WA is malenursesuniforms.siterubix.com. With your platform now, Can I change the siterubix to just .com, meaning : malenursesuniforms.com after i purchase the domain from WA. Great Carson. Will be easy to switch over from GODADDY? OK Carson, Thank you and will be waiting for more info when you are ready! Really like the idea of doing everything right here at WA. Amazing news, I had the same question as Garypick, would like to move my GoDaddy site, am glad WA is looking into this. This is absolutely amazing. 2016 and beyond... WA is the place to be. This is excellent news, Carson! Thank you and the rest of WA's team for building this solution. This definitely is a huge step when it comes to getting new members into building their own sites. Awesome stuff! - I bought my first domain from namecheap last month. I just checked the website and I don't see the option of $15 for 5 email accounts, as per price comparison chart image Carson posted. The private email account service on namecheap starts at $9.88/year for single user (I think). - The Email Accounts that comes with every WA SiteDomains domain is the current SiteEmail feature https://my.wealthyaffiliate.com/websites/email (which is basically webmail), right? It is not an additional email service being introduced here, correct? I have set up a domain email and forwarder, following Craig's tutorial Send & Receive Domain Email via Gmail - Updated 2015 so just wondering if there is any difference with the WA email service with SiteDomains. Just wondering aloud. Pardon my confusion. I also would like further clarification on this, and I am a 1-year vet, not a newbie, lol. Wow, I cannot believe it, it is one stop shopping now. More power to our great community. Happy New year to all. Great news Carson, this really makes WA a one stop shop. I have a question, does WA sell domain names to non WA members? So for instance, if I wanted to promote WA Domain names from an affiliate point of view, can I do that to people who won;t necessarily join WA? In competition to Namecheap for example. Awesome awesome awesome. One question though, does anybody know how to setup a search on a domain that will search all subdomains that are setup under that domain? That is awesome Carson! Yet another reason why WA is #1 and second place really is not even in the same ballpark! Looks like I will have to do a site-wide update on my WA promotional website by changing the content to read, "Wealthy Affiliate Has Absolutely EVERYTHING You Need!!!" I just seached a domain for a possible future website and it's available. Almost makes me want to start a 5th website now, but it's great to know the technology is available when I'm ready. Thanks for the info, this is great now everything can be done through WA. That is really impressive! Thank you, thank you very much! This is right on time. My domain is about to expire next month and I will definitely renew it here at WA. This is a very, very good added benefit to an already beautiful WA program. A question.........can existing domains be transferred into the new WA SiteDomain registration? Wayne: A domain name is sort of like property. If you buy it, it is yours. It is your asset. But like property, you pay property tax or with domain names you pay the yearly fee to own the name. If you quit paying your property taxes, the city takes your property away and you do not own it anymore. Same with your domain name. If you don't pay NameCheap the yearly fee you lose the domain name. So once you have purchased your domain name, like property taxes, you pay to the domain "maintainer" for every. If you quit, you lose your domain name. Many thanks, Dan. Clears it up for me perfectly. I have two new domains on GoDaddy, I have yet to build websites with.......ultimately, there will be six making up my business plan. Would be nice to have them all in WA maintenance, but as you point out, it's not going to happen that way. But I will definitely put the next 4 in WA, leaving the 2 in GD. Of course, you can TRANSFER YOUR DOMAIN NAME from one "maintainer" to another. Why do you say you cannot Dan? So I guess I'm confused now, Ben. However, I first asked the question of Carson (& Kyle) who should know explicitly.......I'd appreciate their answer to settle the debate. Oh I see what you mean now. You can transfer between other registrars but not to WA at present. They are working on it though at the moment. But just to clarify, you can transfer between Godaddy and Namecheap for example. This is great news! I just purchased a domain from Namecheap about 3 weeks ago. Can it be transferred? Hope all is well with your son Carson. That's fabulous news. The security alone is worth the price. What a way to begin the new year. Congrats! Wealthy Affiliate is now a one stop shop! I have a simple question: You say that domain purchasing is available to starter members also, correct? But they won't be able to host it here as starter members, will they? Can they point the domains they purchase here to another hosting company? We're all going to have to tweak our wealthy affiliate reviews, so this is useful information! Being a Briton, we are usually a quite reserved bunch and not usually prone to outbursts but what the heck..........this is AWESOME!! I bought two domains at name cheap.com for a year, is the security comparable to what WA is offering now or can I cancel and re-purchase through SiteDomains? I'm looking forward to registering new domains through this platform. I'm also looking forward to comparing sitedomains against the big names on my website. Thanks for the improvements on WA! I was just thinking that WA would be perfect if we could register our domains without leaving the community... Seems that I've been heard! Thanks Carson, and a very good 2016 to you! Now this is really good news. Have to wait a bit, but I am happy about this. Not sure if this was answered. Have you set up a way to transfer our ie: Go Daddy accounts to WA. I would like to have everything in one place. Hi Sharon. There is a tutorial on doing so. You need to enter into your Go Daddy account and fill in their server name the WA hosting address. In Primary: NS1. MYWASHOSTING.COM and in Secondary: NS2.MYWASHOSTING.COM. Check out the entire tutorial by putting 'transfer from GoDaddy to WA' up here as a question. You should be able to trace the tutorial. Good luck. My question was whether or not we could transfer our Domain names not hosting from Go Daddy to WA. The question was answered above by Carson. That feature is not available yet. Excellent stuff. More power to you guys. Can this site get any better? Always tweaking and improving things for members. Shows a genuine and sincere care for others. This is a great time saver indeed! Hope you all are hanging in there with Kai. Have Faith that all this adversity is for a bigger, better, purpose. Thanks for making this available to ALL members. It should be easier to get people to check out and experience WA. Is there a way to buy a domain and just forward it to any URL? Thanks for all you guys do here! Gwen: Congratulations on raising 5 kids! You can do anything after that ;) Mom's are awesome, BTW! Yes, it is your URL, but, places like GoDaddy allow you to forward your domain to any URL if you so choose. So, let's say you make lots of videos about training dogs, and at the end of the video you say, "Learn How To Train Your Dog Within 7 Days Starting Today! Go to YourDogTrainingURL.com"
Well, you can direct all that traffic to an Affiliate Dog Training course and see if it converts into sales. If not, you can direct it to another Affiliate Dog Training course and see this one converts. Etc. Of course, you could build a website on your domain, too, instead of forwarding it to another URL. It's just an extra option you can do with domains. Sounds exciting, but what about the backups of our websites? Is it still recommended that we make our own ones as well, just to be safe? Hi Bart, we backup your domain websites every single day so that in the case that you lost content, we could restore it for you. Having a backup for yourself is something you can choose to do as well as it will give you even more peace of mind! Awesome Carson, and that's what I'll be doing then. Thanks for your reply! Hmmm so we have hosting and domain name at the same place. A few years ago, my friends’s website got hacked. Not only did the hackers destroy his site, but they also transferred his domain away from his web host and took it over. It took ages for him to prove ownership and get everything back. When your domains are separate, even if someone gets access to your files, your domains are safe (assuming you aren’t using the same login and password). What additional security measured do you have in place against that happening since you are now providing domain names and hosting as an all in one together package? Hi Derek, that's really scary why happened to your friend. It's not possible to transfer a domain and steal it when registered at WA. A transfer would have to be unlocked by myself personally and identities proven. What happened to your friend cannot happen here with SiteDomains. Thank you Carson, for your reply and clarifying the issue. Wow, this is awesome news and a great start to the new year. Thanks guys. Ok. that's good but how can I see the tutorial to create my own domain here with WA? I don't think that they have put one together yet. Go to the light blue Site Rubix button, (left side of page here) click on it and play around to better understand how it works. If you have a domain in mind, then input it here. Dave. I am soooo glad I got stuck @ Lesson 4... haven't quite created a website yet... it must be Fate... I don't understand a lot of the techno stuff yet, but I know enough to realize this is a great step in the right direction, and is quite timely for me in particular -- Thanks C&K ! When Kyle talked about the new features coming up in 2016, I suspected this, BOOM! It is, and I am so glad that now we won't have to do anything outside WA. Now the platform is more awesome than never. And there is more you say? 2016 will definitely be the best year ever (For everyone). The process will be easier and faster, it can't get any better than this. After reading this announcement, my next domain name will be the new Wealthy Affiliate Child. Keep up the good work guys, you are the best. This is fantastic. My problem with gettin a domain name has just been solved. Thank you Carson and WA. You guys are really awesome. This is fantastic.I am so grateful for having found WA when I did.Now with the missing piece in place,everything is under one roof. This is so great. It is nice that everything is within WA now. Being able to start in WA and end in WA is massive. It is also so helpful for those who just don't know where to go or what all these upsells and things are. Thanks for always helping us move forward! Excellent addition. Makes the domain/hosting process so much easier, quicker and no up-selling. Woohoo! Thank you, Kyle and Carson for putting this together for us all. It will be amazing for everyone. This is awesome, no need to bother somewhere else anymore! will I still need AWeber? jphe: AWeber is an affordable and easy to use email marketing and autoresponder tool. If I understand it correctly, it has its own email service (incoming and outgoing) but AWeber also interfaces with a number of other programs. So you should not have to leave AWeber just because you start using the WA email service. I would think you would still want to keep Awebar if you use it, yes. Thank you for the update, Carson. This sounds great. I have just one question, though: are we able to get access to the DNS settings if we want to? Thanks Carson, fantastic idea, I have 3 domains at GoDaddy. Can I transfer them to WA? and if possible could you explain how? Hi Alfred: A domain name (on the internet) is your property. You pay either a monthly or a yearly fee to a company like GoDaddy to maintain that property for you. If you quit paying that fee then you lose the property. So if you want to maintain your 3 domain names at GoDaddy you will have to keep paying that maintenance fee. If you stop, you will lose the domain names. Now if no one wants those names and they are available (Still) when you purchase your domain name at WA, then you will still have the original names. But you will probably have to get new domain names for your sites if you want to purchase a domain name at WA. This is a wonderful addition to the platform, it amazes me how WA continues to develop and introduce cutting edge adaptations. It bodes very well for all the members in their endeavours to create successful online businesses. Thank you. Great news, Carson. Thank you again. This is an absolutely awesome additional service . So many great builtin features. Will give one great piece of mind. Thank you Carson and Kyle for a super 2016 present. We are lucky to be the beneficiaries of the frùits of your continued dedication to excellence...Stay Blessed. Thank you for this information & great work Carson! I wish i can progress a lot this year & being inspired by you, Kyle & everyone else that does the same...!! !